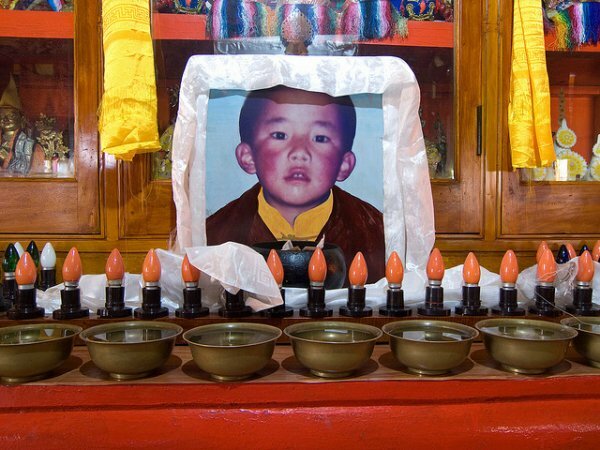 25 April 2013 marks the 24th birthday of the 11th Panchen Lama, Gedhun Choekyi Nyima who was taken into Chinese custody on 17 May 1995 at age six. He has not been seen in public ever since. On 25 April 2012, the International Campaign for Tibet released its report, “60 Years of Chinese Misrule: The Case for Cultural Genocide in Tibet.” The report finds in part that Chinese policies and practices of cultural repression and destruction are so systematic and persistent in Tibet, and their effects are so serious, that they contain elements of cultural genocide. The intense control of Tibetan Buddhism – including the manipulation by the Chinese authorities of religious figures, as personified by the Panchen Lama’s experience – is an area where cultural repression has been most visible and intensely felt by Tibetans. The historic role of the 10th Panchen Lama as an authentic representative of the Tibetan people and Tibetan Buddhist culture during the early years of the Communist occupation clearly inspired the Chinese party-state’s design to undermine the Dalai Lama’s authority in naming his reincarnation and then to manage and control its own replacement. The monks of Tashilhunpo Monastery, the seat of the Panchen Lamas, were placed in an untenable position. In the case of the Dalai Lama and Panchen Lama, there was historically a pattern of mutual recognition of their reincarnations and subsequent religious educations – the so-called ‘sun and moon’ relationship. The Dalai Lama made clear his view that it was his sole prerogative to recognize the Panchen Lama’s reincarnation and that this was a spiritual matter beyond the reach of the PRC government. The abbot of Tashilhunpo Monastery and head of its DMC, Chadrel Rinpoche, was placed in charge of the search committee. The monks of Tashilhunpo had publicly demanded that the Dalai Lama be the final arbiter regarding the Panchen Lama’s reincarnation and knew his approval was essential for the Tibetan people to accept the legitimacy of the selection, but they were in a weak position to resist Beijing’s will. Chadrel Rinpoche tried to bridge the unbridgeable: his religious responsibility to honor the Dalai Lama’s role in the selection process, and his political constraints as Chinese authorities became increasingly hostile to the Dalai Lama. He used every tool at his disposal to get the Chinese to relent on the issue of the Dalai Lama’s role in the process. At one point, he even threatened to quit and disband his team if they insisted that the Dalai Lama could not be consulted. While they did not assent, the Chinese did seem to back off on their insistence that the Dalai Lama have no role. In the end, however, except for one brief meeting between the Dalai Lama’s brother Gyalo Thondup and Chadrel Rinpoche, the Chinese authorities refused all entreaties from the Dalai Lama and ultimately insisted he had no role in the process. Nonetheless, Chadrel Rinpoche managed to send surreptitious updates on the search to the Dalai Lama and receive instructions from him. As the process narrowed throughout 1994 and settled on a single boy, Chinese-Tibetan relations deteriorated further. The 1994 Work Forum signaled that Beijing had decided that extermination of the Dalai Lama’s influence in Tibet was in its best interests. Chadrel Rinpoche’s last message to the Dalai Lama arrived in January 1995 and contained information about the various candidates, as well as the evidence the Rinpoche saw as pointing toward one candidate in particular: a six-year-old boy from the remote area of Nagchu in central Tibet, Gedun Choekyi Nyima. After he reviewed the materials and performed the necessary rituals, the Dalai Lama recognized Gedun Choekyi Nyima as the 11th Panchen Lama. He sent a secret message to Chadrel Rinpoche, who received it but was unable to respond. Chadrel Rinpoche was fighting a losing battle with the Chinese authorities and their loyalists on the search committee to avoid the lottery and confirm Gedun Choekyi Nyima. After several months of fruitless effort to communicate with Chadrel Rinpoche, the Dalai Lama announced on May 14, 1995, that the eleventh reincarnation of the Panchen Lama had been found. Within three days, Chadrel Rinpoche disappeared along with around 30 colleagues involved in the reincarnation search. They were subjected to beatings and other torture during interrogation, and Chadrel Rinpoche was later sentenced to six years imprisonment for ‘leaking state secrets’ and ‘splitting the country.’ Tashilhunpo Monastery was placed under lockdown after the monks there broke into open revolt. Throwing aside any pretext of religious freedom in Tibet, the Chinese government proclaimed the Dalai Lama’s choice “illegal” and its official Xinhua news agency denounced six-year-old Gedun Choekyi Nyima for having “once drowned a dog.” Gedun Choekyi Nyima and his family disappeared into Chinese custody, and have not been seen since despite numerous inquiries from the international community, including the UN Committee of the Rights of the Child, about his welfare. The PRC authorities subsequently installed their own Panchen Lama, a five-year-old boy named Gyaltsen Norbu whose parents were both Party members, in a hastily organized ceremony that involved drawing out ivory pieces from a golden urn and featured a heavy presence of CCP officials and rows of sullen monks. According to Arjia Rinpoche, present at the ceremony, Gyaltsen Norbu’s selection was a foregone conclusion. After the ceremony, a Chinese official accompanying Arjia Rinpoche back to Beijing “unwittingly revealed a shocking secret:…‘When we made our selection we left nothing to chance. In the silk pouches of the ivory pieces we put a bit of cotton at the bottom of one of them, so it would be a little higher than the others and the right candidate would be chosen.’” Tibetans typically refer to Gyaltsen Norbu, the boy chosen by Beijing, as ‘Panchen Zuma’ (fake Panchen) or ‘Gya Panchen’ (Chinese Panchen). Most Tibetans still do not accept him as legitimate. Chadrel Rinpoche was released from prison in 2002, after nearly seven years spent mostly in isolation, and there is uncertainty about his present status and whereabouts. On this, the 11th Panchen Lama’s birthday, we are keenly aware of how his experience connects to the rigid ongoing controls that continue in Tibet and the circumstances of daily life that are provoking the self-immolations protests. If we merely look narrowly at the area of religion in Tibet, we can see that Chinese policies have led to executions, torture, imprisonment, destruction of religious institutions, political indoctrination, expulsion of monks and nuns from monasteries and nunneries, the banning of religious ceremonies, restrictions on the numbers of monks in monasteries, and the extreme disruption of the religions practices of average Tibetans. To address the core issues of cultural destruction in Tibet, ICT calls on the Chinese authorities to urgently take several decisions including, in the area of religion, to suspend measures that codify the Chinese party-state’s inappropriate control over the process of recognition of reincarnate lamas.